May is Asian Heritage Month, a nation-wide recognition of Asian cultural contributions to Canada and a celebration of Asian culture as a whole. One would be hard pressed to find an institution that celebrates that culture as enthusiastically as Centre A (a.k.a. the Vancouver International Center for Contemporary Asian Art). 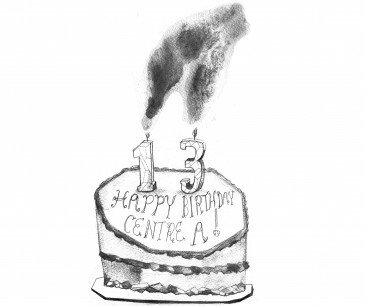 Coincidentally, May also marks the centre’s 13th anniversary. Discorder paid a visit to Executive Director Haema Sivanesan to reflect on the milestone. Founded in 1999 by multimedia artist and arts administrator Hank Bull, Centre A’s mandate is to provide a platform for contemporary Asian art in the form of not only exhibitions, but also public forums, artists-in-residence, screenings, publications and web projects. Since its beginnings it has presented work from over 300 artists from Canada and beyond, produced over 80 original projects and continues to thrive. With Bull having stepped down as Executive Director last year, his successor Sivanesan said the centre is going through a transitional period, but that it is an exciting one of growth and new opportunities. After all, part of celebrating heritage is encouraging growth and prosperity for the future. Coming from a position at the South Asian Visual Arts Centre in Toronto, Sivanesan says that she is looking to develop Centre A’s reputation as “a nationally recognized contemporary art community [who] wants to show leadership.” She and the other staff, including curator Makiko Hara, intend to do this through the traditional means of showing new and engaging exhibitions and by utilizing the rapidly changing way that artists communicate and exchange ideas via the Internet. Their current exhibit is Yellow Signal: New Media in China, which uses sound and video to explore contemporary Chinese life. It will be followed by the reissue of David Khang’s acclaimed photo and essay catalogue for his exhibition How to Feed a Piano. On May 5th the centre will host its 13th Anniversary Fundraising Dinner and Art Auction, with works by a variety of young, local and upcoming artists, including Ken Lum, creator of Monument for East Vancouver (the 19.5m LED cross at Clark Drive and 6th Avenue). 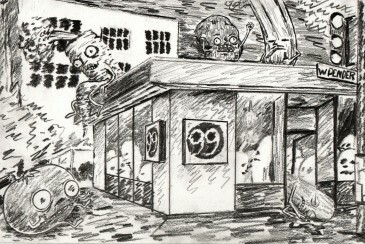 These are the diverse mediums that keep Centre A refreshing and inviting for both artists and the public. Sivanesan added that it isn’t just diversity between mediums that keeps Centre A current, but diversity of Asian culture itself, with artists from a number of backgrounds re-examining traditional Asian art, such as a recent collaboration in progress between a non-Asian artist and an Iranian artist re-conceptualising 18th century Japanese prints. Sivanesan sees Centre A and those who work there as as broadening the paradigm of art history to include ideas that wouldn’t typically fit and being seen through the lens of contemporary art, they create something new in the process. Center A is open Tuesday to Saturday, from 11 a.m. to 6 p.m., free of charge to the public. To donate, become a member or volunteer, visit their website at www.centrea.org.